In the bedroom, one of the ways to save space is by installing a space saving bed. When you think of a space saving bed, the first association that comes to mind is a Murphy bed, a bed that can be pulled up into the wall, and then pulled down. But there are many other options on the market, all of which will help you save valuable space in your bedroom. Suitable best for high ceiling apartments, loft beds nowadays come in modern and versatile designs. Apart from the standard loft bed, nowadays, some studios offer loft beds that can be pulled up to the ceiling during the day, and then pulled down at night. Bonus points since there is no need for moving furniture. 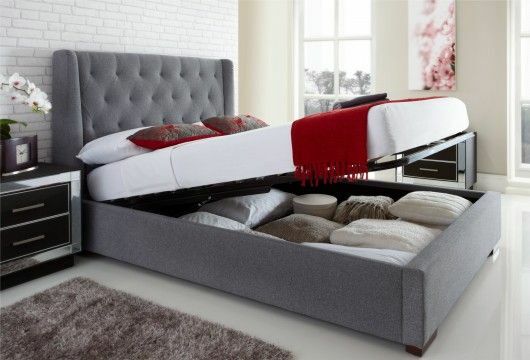 This is the best bed solution when you lack space, and you need extra storage in your bedroom. The shaw uplift bed can be lifted up and underneath the mattress there is room for extra storage. Shaw uplift beds usually come with upholstered headboard. Another solution for people who lack storage in their bedroom, the drawer storage bed is a traditional lifted bed, with drawers coming out from both sides. Depending on the height of the bed, there can be up to 12 drawers installed within the bed. The classic Murphy bed is a vertical bed built in the wall. This bed can be placed into the wall during the day which frees the bedroom. At night, when you want to go to bed, simply pull the bed from the wall, and you’ve got yourself a sleeping piece. Modern Murphy beds can even come with storage under the bed, which transforms into shelves when the bed is pulled within the wall. The same as with vertical Murphy beds, there are also horizontal. The only difference is the position of the bed. Choosing between a vertical and horizontal wall bed depends on the space you have for operating in your bedroom. For those who want to have their books in the bedroom, but lack the space and storage, a “library bed” is an ideal solution. The library bed is another form of a Murphy bed. The difference is that the part under the bed is used for bookshelves. Additionally, the space right and left of the bed is also a shelving. If you need a bed that can be folded down and up anytime for your guests, the folding guest bed is the way to go. Retail stores offer a wide choice of folding guest beds, and the best thing is that you score a high value bed for a low price. The classic sofa bed is probably the most common solution for people looking for bed that can safe them space. Many people think that the sofa bed is “cheap” option. However, in reality, there are many luxury sofa beds that can fit even in the most modern and contemporary styles. Sofa beds can be modern, classic and retro in design. Probably the biggest space saving bed from this list is the footstool bed. The bed is hidden within a modern footstool and can be then transformed into a guest bed or a single bed within seconds. The footstool bed can compliment any interior style, and due to it is small space, the bed can be placed anywhere. This type of bed is perfect solution for people who have little space, and want to have their bedroom and office room folded into just one. The studio desk bed is a desk and a bed folded into just one piece of furniture. The stylish piece provides you with lots of work space and a single bed that can be fold down.